Take an ordinary pizza night and make it extraordinary with this Roasted Butternut Squash Naan Pizza! Pizza night is always a favorite in our house and is an easy way to entertain a large group of people. When I’m hosting friends for dinner, I love to buy the individual-sized naan bread and set out a variety of toppings and sauces for people to make their own combinations. I set out the typical red sauce, pepperoni, sausage and olives, but I also love to add some unique ingredients. 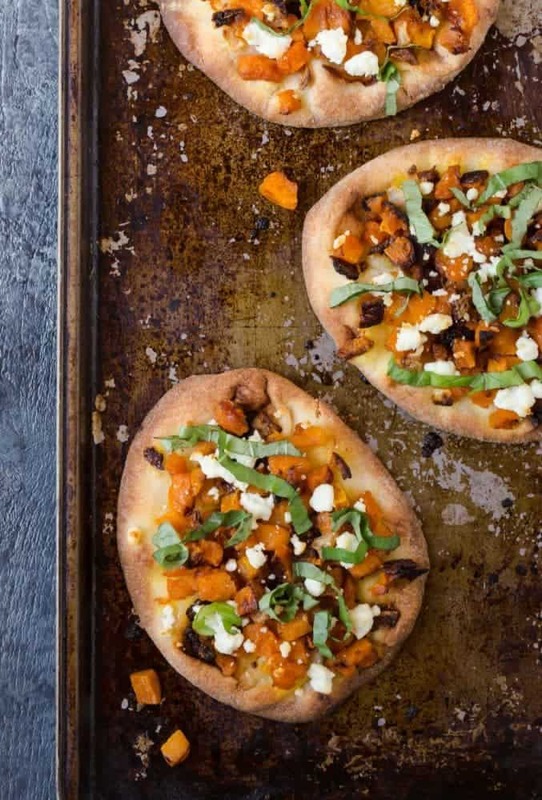 People can make a BBQ Chicken Pizza, a Pesto Pizza with Goat Cheese and Arugula or my new fall favorite, Roasted Butternut Squash Naan Pizza. Butternut squash is abundant right now, and while there are so many great ways to use it, I love the rustic sweetness it adds to this pizza. Plus you can’t go wrong with the addition of goat cheese, caramelized onions and fresh basil. Finish it all with a balsamic glaze, and you will be in pizza heaven! Complete your menu with a great fall cocktail, an arugula salad and a brownie pizza for dessert. You just took the traditional pizza night to a whole new level without a ton of work. Tip: Short on time? You can buy already cubed butternut squash at the grocery store. Yes, I know it’s more expensive, but I love the convenience of it. I pick and choose on what shortcuts I will spend money on, and this is right there at the top. 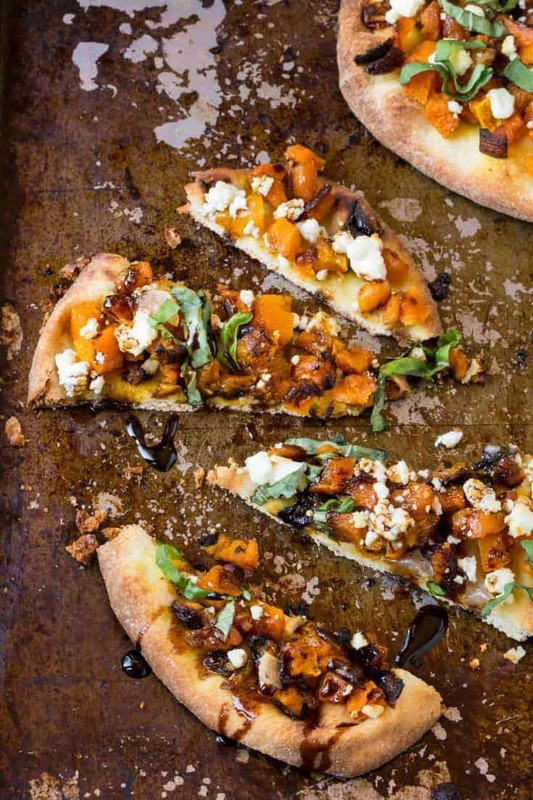 Naan bread topped with butternut squash, caramelized onions and goat cheese. A great dinner or fast appetizer. Evenly divided the butternut squash, goat cheese and caramelized onions on the Naan Bread. Place on cookie sheet and bake 15 minutes or until warmed through and cheese is melty. Scatter basil across top and drizzle with balsamic glaze. Slice and serve immediately. 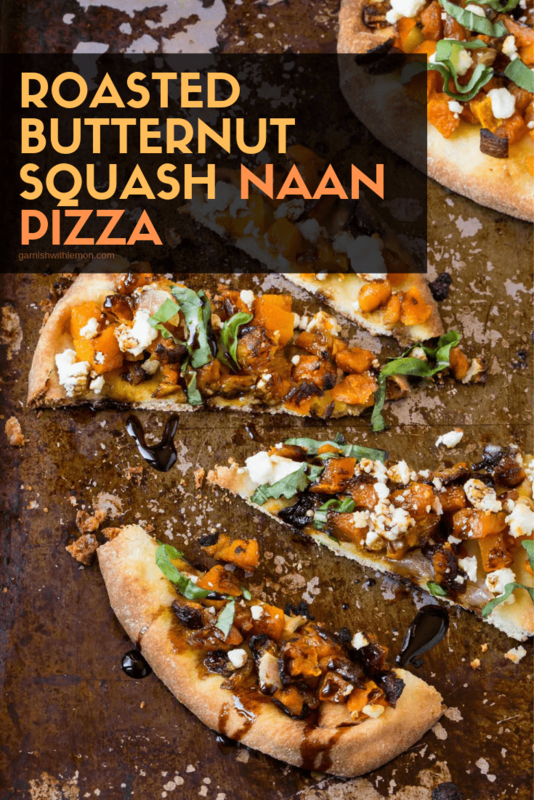 Butternut squash pizza is one of my favorite dishes to make in the fall–Love your twist with the naan! That looks like an absolute treat! I LOVE Naan bread, butternut squash, AND goats cheese. This is making my mouth water even thinking about it. Have you tried it with another flavored naan? I could see it going well with one of the garlic and herb ones! Thanks for coming up with this, I will be sure to try. Flavored Naan bread sounds amazing! I’ll have to try that sometime. I am looking forward to checking out your butternut squash recipes-thanks for the link! This sounds awesome! I love naan pizzas, but your’s is extra special! Thanks-I love the flavor combination! You really can’t go wrong with those three things, can you? Thanks for stopping by, Nicole! To make it easier with a whole squash, first wash it. Then prick it on one side with a fork. Place in a microwave friendly rectangle shallow glass dish and microwave on high for 8 min. with the pricked side up. After 8 min., turn it over, prick the other side and leave it top up for another 8 to 10 min. Remove from microwave, and slice in half lengthwise. This should be easy to slice, remove seeds, scoop out flesh. Easier than trying to cut it raw. Cooking time depends on size of squash. Do you boil the squash first? Can’t wait to try! Hi Kim, I roast mine first, but you could try boiling it too! Let me know how it turns out! Thanks!